Bridal millinery is a part of all milliners work. Expand the styling you can offer through techniques taught by bridal specialist, Suzanne Madden. 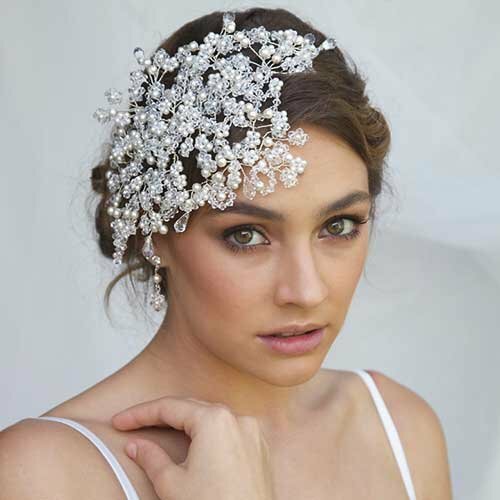 Learn all her techniques and practical tips to create stunning headpieces using Swarovski crystals and pearls all on a wire frame base or comb. BoHo crowns, Gatsby designs and birdcage veiling will be loved by your bridal clientele but in alluring colours also a favourite for race days and special events. Suzanne Madden has been designing jewellery, headwear, accessories, fascinators and crystal & pearl bouquets for 16 years, working with Brides and those attending Gala and Special Events. Her passion to design is evident in her stunning creations and extensive catalogue and continues to grow in today's market. Learn the fundamentals of wired beading to efficiently create elegant loops, buds, leaves and flowers. Use a combination of crystals and pearls in a variety of sizes & colours and secure on a comb to create your bridal collection. Learn to add volume to style using a branching technique to create a shaped piece. Feature flat crystal flowers are taught together with how to add a simple base and add the comb. Complete your bead work with a Bird Cage or Bandeau Veil. Create intricately designed fascinators by adding flower techniques to give depth and volume to your designs or to create fun Gatsby themed headwear. Combine hand tooled flowers with your fascinators or design BoHo headpieces. Lesson support includes online contact with tutor Suzanne Madden to ask lesson specific questions and feedback. Bridal Supplies - Discounted specific materials for this course. Hat Blocks - Quality hat blocks with free shipping worldwide.